In August 1914, following a massive arms race on land and sea, the great world powers went to war. The Great War saw huge fleets of the new dreadnought battleships and battlecruisers put to sea to achieve naval dominance of the world's oceans. Brawling Battleships is a fast paced card game where you get to sink as many of these majestic ships as possible. Everyone is out gunning for your dreadnoughts and they are using every trick and weapon imaginable to sink them: Zeppelins, coastal forts, submarines, old pre-dreadnoughts, Mata Hari and many more zany and unusual dangers. Not to mention the withering fire from the enemy dreadnoughts themselves. 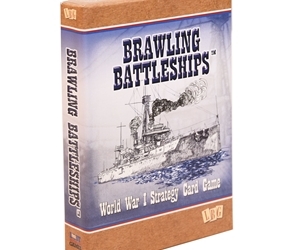 Brawling Battleships is a game for 2 to 6 players. I love this game. It's easy to learn, and fun to play.